The Yaki Straight Lace Front Wigs Guide. Yaki hair has made waves on the lace front wigs scene. It’s answered the demands of those with afro hair (types 4a and 4b for you hair techies) as to how to wear an authentic looking straight haired lace wig. Our Store has plenty of options for you. Whatever your reason for needing or wanting to wear a wig – hair loss or hair growth challenges - this is the place to find out why wearing a Yaki textured wig, will make passers by think it’s your own relaxed hair. A key element of the Yaki texture is that it can also used as the base texture for wavy wigs. So if you’re looking for a wavy wig, like body wave, deep wave or water wave (which can sometimes be quite glossy) then you might want to consider Yaki textured wavy hair as it retains the authentic look of relaxed afro hair that is wavy – huzzah! Who Can Wear Yaki Lace Front Wigs? As the Yaki hair texture replicates afro hair that has been relaxed it’s great for those with afro hair types. We can’t emphasise enough that this is the texture to choose if you have naturally afro hair and you want straight hair. You’ll see from the pictures that Yaki straight hair is completely straight, but has a micro kink added to it to mimic the texture achieved when afro hair is relaxed or straightened with hair straighteners. Much like the information for silky straight lace wigs, you can find a variety of lengths for Yaki textured hair. Your Remy lace front wigs will cost you more beyond 18 inches due to the smaller supply of donors that have that length of hair. Lengths for Yaki full lace wigs are typically 10 – 24 inches but you will find places that offer 8 – 36 inches such as… um well us – Hooray! It’s important to remember to decide whether you only want 100% Remy hair for your wigs for human hair wigs or whether non-remy lace wigs are also an option. Also remember that if you intend to have your wig styled and cut in a way that involves taking length off the bottom, it’s worth bearing this in mind when you choose the length of your lace front wig. 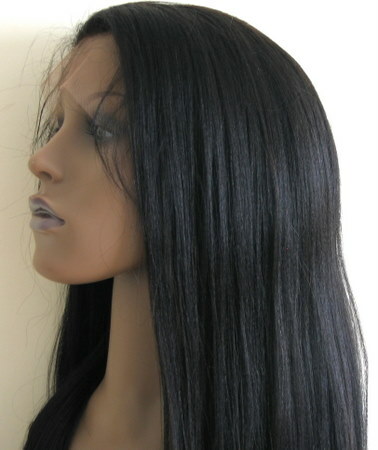 Indian and Chinese Remy hair comes naturally in black to dark brown with the other colours occurring due to being dyed. You can find colours in every shade up to blonde with Yaki lace wigs, however completely light lace wigs tend to be found in the custom wigs’ section and not the ready to wear in-stock section of stores. If you’re darker in complexion you may want to look at our hair colour guide for those with darker skin tones by clicking here, or to find out about the colours that complement all skin tones check out the hair colour and skin tone chart. It’s worth noting that the lighter colours can be expensive because of the permanent dyeing process, so you may opt to have a base colour with 1- 2 highlight colours over about 30% of the wig. Have a peruse of the Peruke’s Caring For Wigs Guide and have a look at these top five tips to get you started. 1. 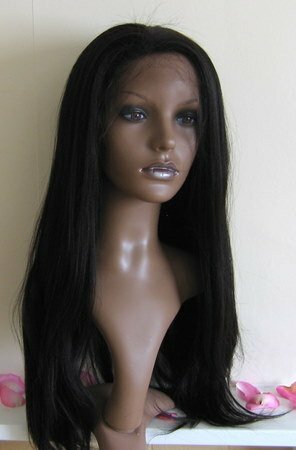 Always wash your Yaki straight lace wig on a mannequin head (a polystyrene/Styrofoam head is fine). This gives you complete control over the procedure, so you can see what you are doing. 2. Use a shampoo for dry/damaged hair (make sure it’s for coloured hair if you’re wig is coloured in any way) I like to use one that’s for coloured hair just as a matter of course. 3. Never blow dry your wig with a hooded dryer or otherwise! This will damage the hair and shrinks the lace of the wig and you can’t wear a wig that’s too small! Also you don’t need to use straighteners as it’s straight already, but if you must, do so occasionally and on a low setting. 4. Use an anti frizz serum when wet to keep the hair smooth on your Yaki straight lace wig. Avoid anything with mineral oils as this ruins the hair. You really don’t need to use much in the way of moisturiser for Yaki straight hair, but feel free to mix 70% water with 30% glycerine or buy and oil free spray. 5. Denman brushes are great for Yaki straight lace wigs and the hair can be combed whether wet or dry but don’t over comb the hair and don’t comb it too much when wet as it can contribute to shedding of your lovely Yaki straight full lace wig! Bob’s your uncle! There’s your Yaki Straight lace front wigs guide sign, sealed and delivered!